Your pet too can be overjoyed to have a new toy like this thrilled #PetShedPet. 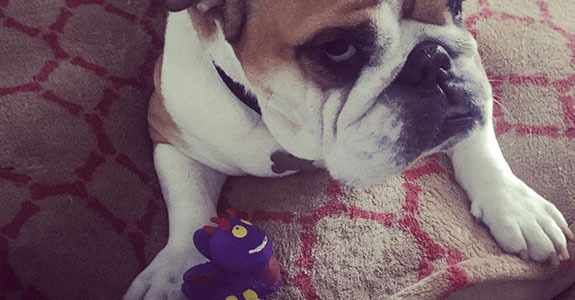 Write a review and you'll go in the running to win a pack of pet toys. If you want your pet to be happy, emotionally balanced and healthy, treating him/her to a pet toy or two is an excellent idea. Using a pet toy to engage in play with your cat or dog will help to strengthen the owner-pet bond, bringing you closer to your furry friend. Playing with a pet toy can also help to reduce stress and depression, which often occurs in dogs and cats which are left alone while family members are at work or school during the day. Our range of pet toys features high quality products designed to allow your pet to play safely while offering mental and physical stimulation. Made from durable, non-toxic materials such as pigskin, natural rubber and latex, you and your pet will love our range of cat and dog toys. Felines may sleep for an average of 13 to 14 hours every day, but that doesn't mean that they don't like to play. Some pet toys which are specially designed for cats include an ingredient called catnip. This herb is well known for creating a strong reaction in felines, making them behave in a euphoric mood, often rolling around and being highly playful. Cats will also adore any pet toy which mimics their natural prey of birds, fish and rodents, so many of the pet toys that you'll find here imitate these creatures in form or movement. You'll soon get your cat's full attention when you dangle a colorful toy in front of him or roll a ball past her bed. Cat toys are great if your pet is an indoor cat and can help in the fight against pet obesity, as it playing burns off excess energy. Whether your canine companion is a Chihuahua or Newfoundland, it needs play to feel confident and content. Our range of pet toys for dogs includes different types of toys which you might like to use at different times. Chew toy type pet toys are very useful as a distracting alternative if your dog tends to take out boredom or aggression on your belongings and furniture. For puppies, you can buy teething chew toys which will help soothe your small dog's sore gums and prevent him picking up on bad habits. For those pet-owners who want to make sure their dog gets adequate exercise, pet toys which are designed for you to throw and your pet to retrieve are an excellent and fun choice. Meanwhile, toys which can be filled with treats provide a challenge and will occupy your dog preventing loneliness if it is at home alone.